This time of year is my absolute favorite. The air starts to get cool (hopefully soon), the leaves change colors, the Tide is rolling, and our community has so many fun activities going on. Some of these are events that we have enjoyed the past few years and some we have never been to before, but hope to give them a try this year! This is one event I’ve been attending since I was a kid and look forward to every year. The day kicks off with a parade at 9:00 am. There are several unique vendors, local artists, a car show, and entertainment by bands and local dancers (when I was young our dance company performed in the gazebo and I thought it was so fun!). There is an arts and crafts area for kids, a petting zoo, pony rides and bounce houses. Be sure to bring your appetite because there are several local gourmet food trucks lining the streets. Mark your calendars – it’s THIS Saturday! For the past 3 years we have gone to Tate Farms and have had a great time, but we have heard very good things about Lyon Family Farms in Taft, TN as well. We have been eager to give it a try and plan on doing so this weekend. Both have a petting zoo, bounce houses, playground, tractor rides, concession stands, and you get to pick your own pumpkin. My kids’ favorite is the corn pit! Tate Farms is open through October 31 and Lyon Farms is open until October 29. Follow the links for admission pricing, hours and more information. We love picking our pumpkins! We finally got to go to the Beirgarten at the Space and Rocket Center a couple of weeks ago. This is a free event to attend and there are food and drinks for purchase. They have German cuisine and craft beer and wine. It was very tasty! There is a play area for children and a live German band. Plus it is for a good cause because a portion of the proceeds goes toward a different charity each week. I’ve mentioned the Botanical Garden several times on this blog and how much we have loved having a membership this year! During the fall there are neat scarecrows set up all over the garden. It’s beautiful as the leaves begin to change. When we went a couple weeks ago there were SO many butterflies in the Purdy Butterfly House. The children’s garden is our favorite area so be sure to check it out if you have young kids. This is a fun little event where kids can trick or treat, paint pumpkins, get their face painted, take a hay ride, and just play in the children’s garden. We had a blast last year, although we’ll be out of town this year so we’ll have to miss it. This is a new venue in front of where Madison Square Mall used to be (beside the Holiday Inn). You may have seen their tower while driving down University Drive. It is still in the works and right now they are only open for certain events. On Mondays they are open for Hangry Hour with a different food truck each week. Alchemy Lounge coffee will be coming soon, which I’m super excited about because, well, I just love coffee. Next week Beast Mode food truck will be there. I think this place is going to be pretty awesome once it’s done. We actually went to Hangry Hour today and it has a very cool, laid-back, outdoor atmosphere, similar to several of the places we visited in California this summer. Huntsville needs more places like this! Be sure and make a trip over there one Monday on your lunch break to show them support and help their business grow! Tickets: Early Bird Tickets (Now-Oct. 26) – $5/child; At the door – $8/child. Adults are free. Last year was our first year going to this event and we had alot of fun. It was at Constitution Village last year but they ended up at max capacity so they had to stop selling tickets. I’m guessing that’s why they moved locations this year. There will be games, crafts, and trick or treating so dress up and bring your trick or treat bags! I love going to multiple Halloween events each year so that I know we get our money’s worth out of our costumes! Plus, I always tend to get a little sad when it’s all over and we don’t get to dress up anymore. This is an event our church puts on for the community each year and it’s always tons of fun! There are all kinds of games for kids of all ages, inflatables, hay rides, live music and free food. Raley’s first picture with Santa at Under the Christmas Tree. How sweet is this! This is another event that we enjoy going to each year. It is incredible what people have created out of lights! Early in the season you can walk through, which I actually enjoy more than driving. There are a couple different stations set up with coffee and hot chocolate (you can even have your coffee spiked if you’re into that). Its fun to just stroll through, in the crisp air, enjoying the scenery. There are some nights that they even let you bring your dog. Then starting the day after Thanksgiving (November 24) they start the driving nights, where you simply load your family up in the car and drive through and look at everything. I like doing walking nights better for two reasons – 1. My kids are still little and have a hard time seeing everything through the window. 2. When you’re walking you can set your own pace. You don’t have to keep moving along because there are people right behind you. If you want to slow down you can move to the side. If you’ve never checked out the Galaxy of Lights before I highly recommend it this year! Again, we’ve never done the train ride but it’s something we would really like to try. The Santa Train is exactly what it sounds like – a train ride with Santa. Each child gets to visit with Santa, get their picture made and they get a treat at the end of the day. These rides are during the day time. The one that we’ve really wanted to try is the North Star Limited. This one has a Polar Express feel. The train departs at night, under the stars. Kids are encouraged to wear their PJ’s and on-board everyone gets a snack and gets to visit with Santa, just like on the Santa Train. Raley loves the Polar Express movie, which is the reason I think she would love this ride. This is for sure one of my favorite Christmas traditions. 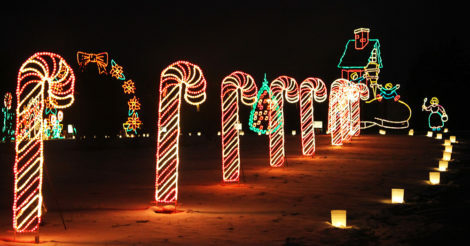 There is so much to do there – gingerbread cookie decorating, arts and crafts, story time, pictures with Santa, a light maze, and tons of decorations to enjoy. It even snows every 30 minutes or so. I would suggest getting there early and seeing Santa first. The line gets pretty long and in my experience, young kids don’t like to stand in line. In the past, if the line is long, we would switch out who would keep our place in line while the rest of us see everything else that there is to see. A lot of times we’ve seen and done everything just in time to hop in line to see Santa. I hope everyone has an incredible (and not too crazy) holiday season! I know I’m looking forward to it!